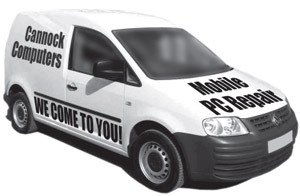 Cannock Computer Systems - Minimise your problem PC down time with Mobile PC repair - We Come to You! Minimise your problem PC down time! Cannock Computer Systems has been serving Cannock, Stafford and the surrounding area for over twenty years. Founded in 1997, our company's vision is to offer quality products and services that cater to all different levels of users. From student to senior, beginner to elite gamer our aim is to make your computer experience as easy as possible; whether it be removing viruses, recovering your data, replacing a broken screen or whatever other technology hiccup you've encountered. We specialize in offering fast computer and laptop repairs to get you back on track when technology fails on you. New and 2nd user computers always available.